Welcome to Episode 2 of the Incarnate Process. 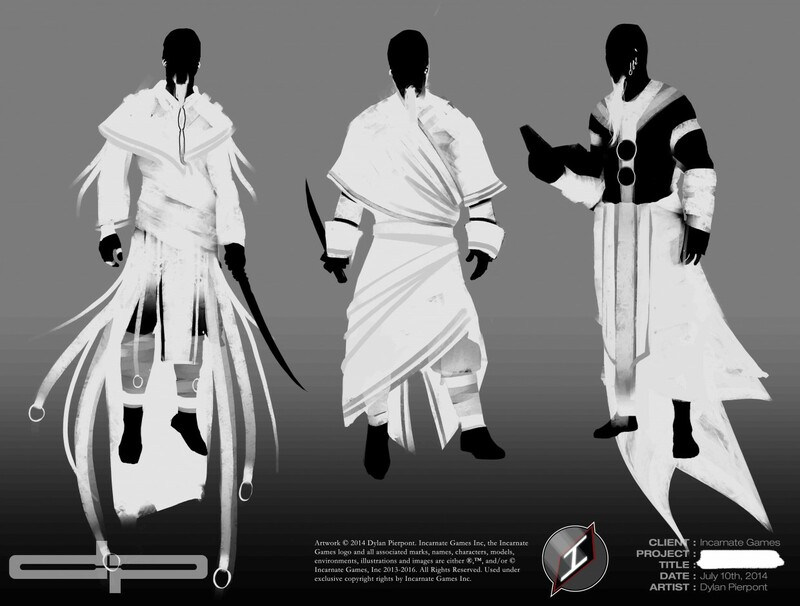 Today we take a look at more silhouette concept art by the amazing talent that is Dylan Pierpont. Distinguishing features: Bald, very long and thin bleach white flowing beard (like the Pai Mei from the movie Kill Bill, but with no mustache), several earrings. Though he is built muscular and tall, he is not broad except at his shoulders. I’d like to see him balancing on one foot as though he is almost levitating in one concept, another where his feet are pointing down because he is levitating, and for the third any stance you’d like. He is light, the quickest of all the kings. Through the billowing (of perhaps sleeveless shirts) you can see incredible muscle definition. He is the most learned in martial arts as well as all other philosophies and such. Kariis wears a circlet across his forehead as a crown with an Aria stone (White opal type gem) in the middle. The sword doesn’t need to be exactly this [referencing a shared image], honestly it could be a dagger as well. I think I’d like to see both. Let’s try two different short swords that look similar to this, and then do another with him holding a curved dagger in a reverse grip, the way a rogue would. He also has a scabbard (sheath) belt tied around his waist. I worked a bit with the poses you suggested in the character description. As a general rule I try not to worry so much about a pose in this stage just because these poses are meant to show off the costume in the simplest/clearest way possible. Think of the silhouettes like mannequins used to display the wardrobe of the character. Attitude, gestures, facial expression; those are all things we can explore further in a second round of sillos or even into the tonal stage, before moving onto the final image. Epic. I like all of these ones, too! I was surprised to see that you showcased the concepts in white, very cool. I like several elements you incorporated in each one of these, we will most likely do a combination of these ideas. I think I was right about the book, I have a feeling it won’t translate into the final version. I also can see what you mean about the use of mannequin style poses, I will keep that in mind from now on. The rings on the ends of the straps – fantastic! The white beard, earrings and the short sword, all on point. I anticipate we will make his beard twice as long (maybe), and add even more straps. I like your design for the dual-ring-tunic piece as well. Again, fantastic work Dylan. I can’t wait to see more! Ah! I’ll be sure to make the adjustments on my end so I don’t confuse myself further. Sorry about that.I figured the white would help sell the contrast a bit better. That’s a large part of this character’s design, so it wasn’t really an added effort to make that aspect visible in this stage. I too think he could benefit from a combination of the three. He’s going to be a really fun character to design overall. It’ll be really cool to see his billowy fabric in full for the final painting.As far as the book goes, we could try something like this, where it’s treated more as an accessory rather than a primary prop. It could be attached to a rope that’s slung around his hip perhaps. That way you can still incorporate the dagger/sword without losing his wise and experienced nature. Intriguing. Perhaps the book could be slung around his hip like you said. It does make sense that he has the book, its part of his character makeup. If it turns out that he would appear to be unhindered by the book during battle, I wouldn’t be opposed to having it incorporated. It would definitely give him an aspect that none of the other kings have, which is a good idea. We shall discover more as we go along. Hey team!I think we have enough to move forward with the tonals on Vara tomorrow (9/18). I’m wondering though do you have the final dimensions for the playmats? Because I was thinking, with Kynazarr everything about his figure was very contained. Where as with Vara we have room to play with the billowing of his fabrics. So if I can get the dimensions of the playmats, I might be able to design the flows of his fabrics around the playmat space, rather than have everything about the character entirely contained on the left side.Thoughts? Dylan,I like the idea of the flowing fabric around the player mat space. The player mats are 16 inches wide by 7 inches long. I have shared with you the folder showing the final mockups for the player mats on the Google Drive so that you can see the basic areas that you have to work with. Here are a couple notes on Kariis. As you know we were talking about the book being treated as an accessory. I have found the perfect example in my view of how this can be done. Check here (I have also uploaded the image to the drive)[link removed]You will notice that [name] here has a book that is attached to his hip with a chain. Imagine we were to do the same thing BUT INSTEAD have a white fabric strap around his opposite shoulder that is connected to the book using those metal ring loops that you have. So it would be like a bag that he has slung across his body but instead of being a bag its a book. Also, in the drive (Kariis Vara folder) I have added a photo of the handle of a sword that is shaped like a bird. This would be awesome to make for Kariis BUT ONLY IF we will be able to see the hilt of the sword. Here is a link to those images as well:[link removed]Remember though that Kariis has a curved shortsword and not a gladius as depicted in these images. Also, one final thing. If you think this will work well, I want his eyes to be COMPLETELY white, glowing white. No pupil, no iris, just all white, with white smoke emanating from them similar to this page:[link removed]Let me know what your thoughts are on these things. Great ideas. I especially like the glowing white-eyes. I tend to do that for a lot of my darker themed images and the results are always enjoyable.I think we can take care of everything here. The only one I have concerns with is the bird hilt. If he has the sword sheathed, I think we can pull if off, but if he’s holding it, that might be tricky to show. When I send off the tonals this evening we can take a look and see what’s going to work best.Thanks Jason! Sounds good. Like I said, no worry on the hilt for this one. Sounds like that would be more of something that will be introduced once we do the orthographics for the 3D modelers. Stay tuned for EPISODE # 003: Eloden Concepts which will be posted soon!